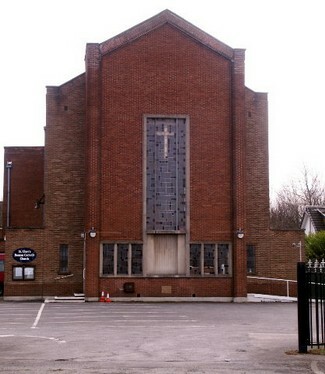 St Francis church was built circa 1934 to provide for the catholic community of the expanding areas of the west of Linthorpe, Acklam and Whinney Banks, The parish area originally covered the whole of Acklam, through Brookfield and up to Hemlington. St Clare's and the "new" Cathedral stand in that part of the original parish area which for most of the 30's, 40's and 50's was mainly arable area. 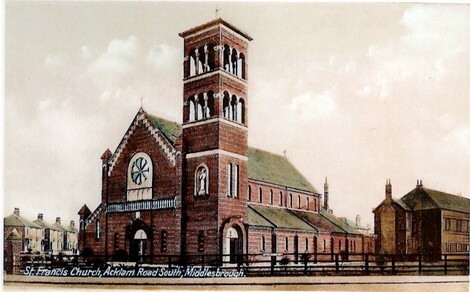 With the residential development of Acklam (South) and Brookfield, in 1967 St. Clare's church was built and established as a separate parish to ease the tremendous congregation pressure that was being felt at St. Francis (then with a Parish Priest assisted by two curates celebrating at least 4 Masses every Sunday plus Masses at Hemlington hospital). In more recent years the pressure of congregations was continually reducing but, nevertheless, sufficient to warrant at St. Francis daily Masses and two Sunday Masses under the care of a single Parish Priest. Meanwhile, St. Clare's also had daily Masses and Sunday Mass served by its own Parish Priest. However, in 2013 the reduced congregation at both St. Francis' and St. Clare's, together with a diocesan clergy reducing manpower, made for further major change. In August of that year, at the time of St. Francis' parish priest reaching retirement age, the parish of St. Francis and that of St. Clare's were brought together under the care of a single parish priest. Formally the extended parish is called St. Francis Parish, with St Clare's church being a 'chapel of ease'. But, reality of the local situation is that it is referred to as "St. Francis' & St. Clare's". St. Francis of Assisi, Acklam, Middlesbrough. Again, due to diocesan clergy reducing manpower, In October 2018 further change occured. Utilising the proximity of the Cathedral and its clergy staffing, Bishop Drainey took the difficult decision to move St. Francis' incumbent parish priest to another parish and cover the needs of St. Francis parish by "servicing" it from the Cathedral clergy. Thus, Mgr. Robinson took up the extended role of Parish Priest for St. Mary's Cathedral and St. Francis' Parish. There are a variety of parish support, evangelical and social activity groups within the parish - see web page Parish Information > Parish Activities - for details. Its geographic area includes a number of residential/nursing homes. An independent but mutually supporting social club, St Francis Social Club, is established with its own premises at the rear of the church presbytery. All of these things, together, create an an active, parishioner participating parish.